We went for a battle we have not heard of any one having done re-fight. This was a action were the French VIII Corps was attacked by the Austro-Russian army under Kutazov in the Wachau Valley 73 kilometers from Vienna on the Danube River in Austria. We made a few adjustments to make the battle a little more playable. 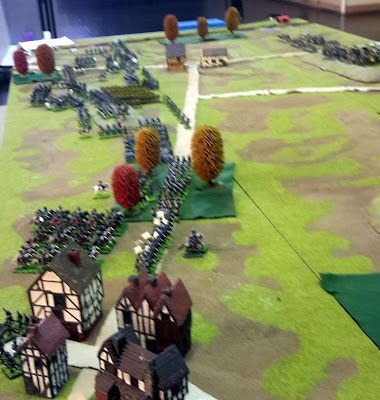 Added a bridge for the French 3rd Division (historically did not take part) to enter the battle and have the Russians move through the mountains at a quicker pace than historically. Also used special event cards to through in some random events. More of the 2nd Division. One regiment from the first brigade would stop at Oberloiben. Russian 2nd Column moving through the steep hills around Durenstein and Krems. Austrian Grenz being pursued by French infantry at Oberloiben. More of the action around Oberloiben. The Austro-Russian 3rd Column had drawn a flank march card and they came on from the hills on the other side of the Danube into the French right flank. French cavalry pursuing Russian cavalry from across the Danube. the 3rd Column was surprised when the French 3rd Division came at the same place from an event card, go figure that one. The 3rd Division hitting the 3rd Column in the hills. Masses of Russians moving across the hills against the French 1st & 2nd Divisions. French cavalry heading towards Oberloiben. A brigade of the Russian 1st Column from Stein. The French C-in-C pulled and event card against this brigade taking it down a morale level. Didn't matter though. Cossacks artillery and infantry of 2nd Column. Where are the gun crews? The 3rd Column held the French off for the day thus helping in the Austro-Russian victory.